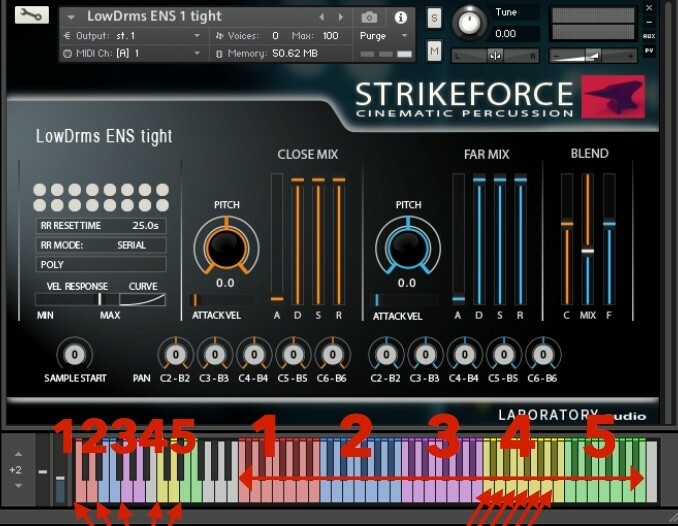 Today we’re taking a look at an interesting new cinematic percussion library from a newcomer brand in sampling: Laboratory Audio’s very first product STRIKEFORCE. 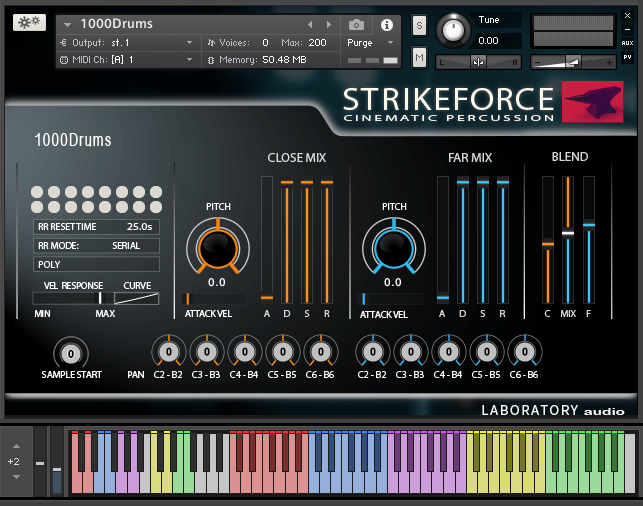 Created with professional media composers in mind, Strikeforce seeks to deliver the big and massive modern film score percussion sound made popular by recent Hollywood blockbusters like Mad Max: Fury Road, Deadpool or Batman v Superman: Dawn Of Justice. In the course of this review, we will find out together, what Strikeforce got up its sleeve and if it can compete with some of the leading cinematic percussion libraries out there. While Laboratory Audio, the brand that developed Strikeforce, may be quite a fresh face on the cinematic sampling market, the guys behind the brand are definitely not. Laboratory Audio’s co-founders, Thor Laewe and Tobias Enhus are both seasoned composers who gathered plenty of prestigious music credits along the years. 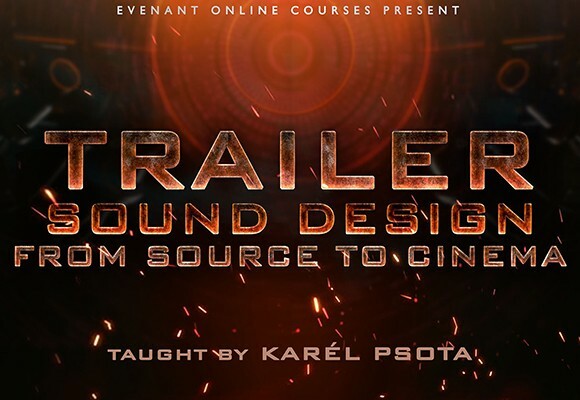 Among those are soundtracks to dozens of feature films including additional music for Black Hawk Down and Blade: Trinity, TV series like Cold Case and Top Gear, a Spiderman video game as well as countless music contributions to blockbuster trailer campaigns. 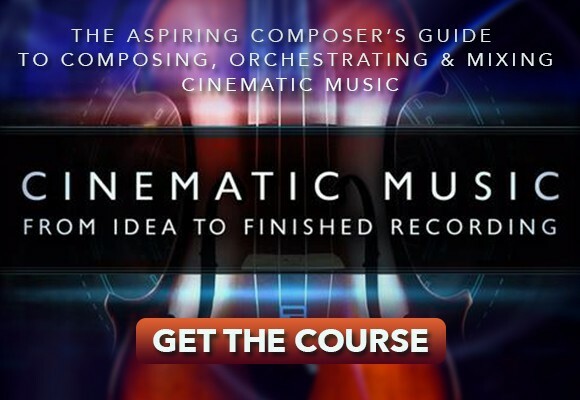 You may say these guys know their tools which makes it even more exciting to see them teaming up for their own take on a cinematic percussion ensemble library. First off: it might be important to know that Strikeforce is not intended to be a traditional orchestral percussion library! While it also features percussion instruments found in the symphonic orchestra like snares, toms and anvils, the library focuses more on the contemporary sound of larger-than-life percussion ensembles. This particular sound includes drums and percussion from all around the world including huge taikos and buffalo drums, as well as more obscure and hybrid sound sources. In recent times, this contemporary percussion sound can be heard on countless cues of top-notch film composers like Junkie XL and Hans Zimmer. The drums for Strikeforce were recorded in various locations in Los Angeles by industry-leading musicians. As they state themselves, during the recordings the developers focused on two major factors: recording at the highest sound quality while capturing as many dynamic layers and round robins as possible. Following this mantra, they sampled and processed over 100 playable patches, featuring both percussion ensembles and solo performances. On top, you get a neat package of pre-designed cinematic impacts, sub booms, whooshes and other FX. Strikeforce comes as a sample library for Native Instrument’s free KONTAKT Player and supports the new NKS standard. Strikeforce features three main categories: Ensemble & Solo Percussion, Impacts, Menus & FX as well as ‘Tick Tocks‘. The heart of Strikeforce definitely lies in its huge variety of big and bold percussion ensembles. While some patches can be tracked back to particular instruments like bass drums, toms or surdos, the majority of presets is labeled a bit more cryptically (Absurdo, Mauser Ensemble, Overlord, Bomber, etc.). On some instruments like the Low Drum Ensemble, Buffel Ensemble and the aforementioned Overlord patches, you can choose between tightly struck hits and a more loosely performed version. You will also find a couple of flam hit variations. While the tight hits are perfectly suited for powerful, accented rhythms, the loose hits and flams add a remarkable sense of weight and mass to your groove as they really spread out the sound of the ensemble right in front of you. Many instruments are presented both as ensembles as well as solo patches, which makes it easy to stack and combine different sounds. These sounds are what made the soundtracks to Mad Max: Fury Road and Deadpool so popular: Huge percussive hits, sharp and punchy rhythms accompanied by blazing fast drum rolls and fills – to which we get in a second. First, let’s move on the next category of sounds featured in Strikeforce, the Hybrid Drums. While I can only guess the origin of the sound featured in those patches, I assume they are a blend of organic drum sounds blended together with synthesized or heavily processed signals. The patches found in the Hybrid Drums folder sound a bit more experimental to me which makes them a perfect fit for percussive FX, interesting hit points or accents in an action cue. Unfortunately one of the patches, the Apollo Drums, has some nasty clipping at the start of each sample which renders it practically useless, but I guess it’s no big deal to fix this issue with a quick update. You can, however, quickly fix this yourself by dialing back the Sample Start which is accidentally set to 100%, back to 0%. Remember to re-save and overwrite the patch afterwards and you’re good to go. Although most of the sounds have a certain amount of reverb genuinely baked into the recording, it really pays off to make good use of the dry/wet mix in order to add interesting textures to the drums. I will go on more about the dry/wet mix later in the review. Next we have a neat collection of percussive metals, including gongs, sizzle drums, giant metal sheets and smaller found sounds like pipes, trash can lids and so on. While these patches work very well as glaring, industrial impact sounds, they also make for perfect low booms and rumbles when used in their lower dynamics. We move on to our next category, which is the Small Drums. Now, as everything else in life, there is only dark when there’s light, there’s only loudness when there is silence. Without getting to philosophical – what I intend to say is, that in order to create compelling cinematic rhythms, you need both: big, massive accents and small, vivid grooves in between. The combination of these forms a rhythm that evokes the sense of urge, danger and suspense. While the big and hybrid drums cover the first part, the Small Drums folder takes care of the second one. In here you will find all sorts of medium to tiny hand drums, toms and other ethnic percussion instruments that are perfectly suited to create steady grooves and interesting fills. Next in line is an assortment of various rock and concert snares. Like some of the big drums, the snares are available both as ensembles and solo patches. There are even some presets (lovingly labeled ‘Death by Snare’), that combine all 35 snare drums stacked on top of each other for ultimate snare overkill. You can use all those snare patches to both establish and support driving rhythms, or you could turn the wet signal up and add big sploshes of sizzle to deep drum hits. Also, due to the large amount of round robins included in Strikeforce, you can create realistic and powerful snare rolls, transitions and crescendos. We head forward to the second main category, Impacts, Menus & FX. As the name suggests, here you will find all sorts of epic trailer hits, sub booms, whooshes and an elaborate set of anvil patches. Some of these menu patches got a little specialty to them which the other presets don’t have. When loading up either the Faceripper or Soft Impacts Menu, you’re provided with three different areas on the keyboard. While the middle (cyan) one is giving you the full impact with a lead-in whoosh, the lower (orange) and higher (yellow) ranges play just the whooshes or just the impacts. This way, you can create your own whoosh and hit combinations – a feature probably inspired by Heavyocity‘s renowned Gravity library. Lastly, we take a look at our third category – the Tick Tocks. This folder will provide you with tiny, hi-hat-like metallic clack and tick sounds that allow you to create fast and forward-moving rhythmic passages. This is a stylistic device oftentimes connected to Hans Zimmer and his scores for Inception, Interstellar or, just recently, Dunkirk. For this category, Laboratory Audio recorded up to 32 round-robins to avoid the dreaded machine-gun effect when playing very fast lines. These patches are lifesavers in situations when you want to establish a feeling of urgency and tension without pulling out the big guns. As the functions and controls of Strikeforce’s interface are well-documented in both the manual and several tutorial videos on the developer’s website, we’ll just go quickly over them and concentrate more on the library’s unique features. This is what Strikeforce’s interface looks like for most of the patches. While it can look a bit crowded and intimidating at first sight, you actually get the hang of it pretty quickly. Apart from that, you will only be needing a fraction of the controls available most of the time. Represented by greyish-white dots, you’ll find all the round-robins recorded with a given patch. Clicking on any of the dots allows you to deactivate certain round robins. Below you can choose if you want the round robins to be played either in sequential order or randomly. While the first option assures that you will never hear the same sample two times in a row, the randomized option has its advantages if you want to avoid the recognition of round-robin patterns when playing certain lines over and over. Next, you can move into the start of a sample with the sample start control, which allows you to tighten up loosely played samples. In contrast to percussion libraries from other developers that feature multiple different microphone positions and mixes, Strikeforces gets along with two mixes: close and far. Pre-wired to the modwheel, you can easily ride and automate your close/far mix and change the wetness in the middle of your performance. Each of the mixes has its own ADSR envelope that allows you to further shape the dynamic curve of your samples and reverb tails. Another control available for each mix is the global tuning of samples, ranging from -12 to +12 semitones. With these dials, you could tune the dry samples differently than the wet ones and create interesting blends with your modwheel along the way. Talking of pitch: Each one of Strikeforce’s drum patches is presented in 5 different pitches laid out across the keyboard. You get the original tuning in the middle (purple) and two pitched down and pitched up versions on either side. This effectively expands every patch by 4 additional instruments and allows you to turn solo patches into ensemble by hitting all of the pitches at once. It also means that you can take ensemble patches and pump them up into even bigger ensembles by using multiple pitches simultaneously. For each pitch zone on the keyboard, there is an individual pan control which allows you to spread the different pitches of one instrument around in the stereo spectrum. With this, you can create super-wide sounding drum ensembles or assign certain pitches to a particular side. Some patches are already pre-panned widely by default, but you can change and save the settings anytime you want, should you not want to go with the wide stereo image. A little quirk I noticed on some patches, is that while the close mix is panned center, the far mix is pre-panned hard left, which doesn’t make any sense for me, really. Because of this, you might want to check the panning of your mixes before automating the modwheel. Another feature, that is – I think – pretty unique to Strikeforce, is that most patches are playable in two different ways. In the lower corner of the keyboard, you have a traditional two-note layout with dynamic layers chosen by the velocity of your playing. Along with the traditional layout, you’ll find the so-called STRIKEFORCE layout, where each velocity layer is laid out next to each other in an octave (see picture above). Each set of two keys represents one velocity layer. Together with the differently pitched versions, each drum can be stacked and doubled up multiple times – all from within a single patch – to sound as thunderous as an entire percussion group. Keep an eye out on the levels though: Stacking multiple pitches of an instrument in high velocity ranges keeps overloading Kontakt’s level meter constantly. You could either dial down the overall volume by hand to begin with or maybe we’re lucky and the developers throw in a more balanced solution in an upcoming update. 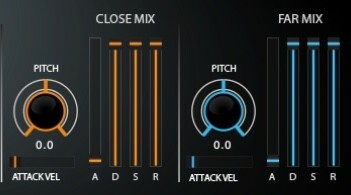 In addition to all the individual presets, Strikeforce contains 12 Multi patches featuring a pre-selected selection of presets. These Multis allow for very quick rhythm creations since the selections mostly cover the whole frequency range – all playable on the same MIDI channel at once. A helpful little feature, is that you can control the close/far mix globally with your modwheel for all the presets in your Multi patch. This way, you’re able to change the sound of your entire block of percussion simultaneously. Phew, that was pretty much to cover in one single review and I’m glad you made it through to this point. After extensively checking out Strikeforce, what can I say? After watching the videos on Laboratory Audio’s website, I was very excited to try out the library and well, the excitement didn’t leave me so far! Sure, Strikeforce is not perfect, there are still little quirks here and there but nothing that can’t be fixed with a future update. However, these small bugs are nothing in comparison to the huge amount of great and powerful sounds you can get out of this product. You’ll find everything from massive low ensemble hits over punchy hand percussion up to the tiniest clicks and clacks – and most importantly: everything sampled in a generous amount of round-robins and dynamic layers. 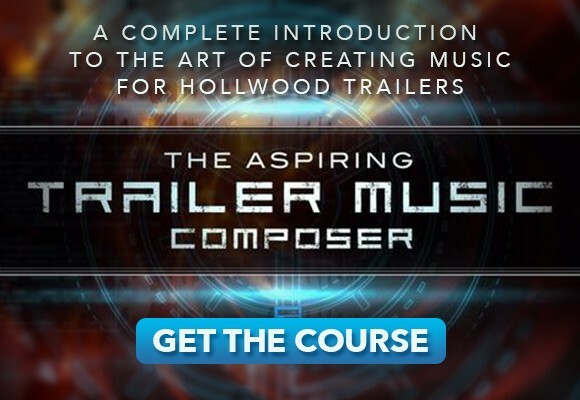 This allows you to perform super-realistic rhythms and percussive fills that really get close to the masterfully crafted sounds from composing giants like Hans Zimmer or Junkie XL. No surprise, that JXL himself gave his testimonial to the product. In fact, using the keyboard range to control the dynamic layers of a patch instead of triggering them with velocity, is a method I first saw Junkie XL do with his custom drum samples in one of his remarkable Studio Tour videos. Now back to our conclusion. 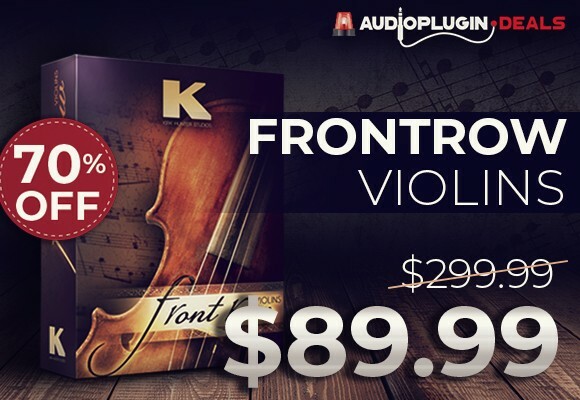 Strikeforce is definitely not your all-round traditional orchestral percussion library. And it never intended to be one. Instead, it delivers everything the developers promised: powerful contemporary ensemble and solo percussion suited to modern film and game scores. With its easy playability, huge variety and great quality of percussion sounds as well as the remarkable amount of dynamic options, I’m sure Strikeforce will find its way into the arsenal of many composers. Who knows, maybe it will even push one or another of the current percussion library top dogs off their throne? We’ll see! Strikeforce by Laboratory Audio is available as a download for $389.00 via the developer’s website. There, you’ll also find useful tutorials on the usage, sidenotes on the development as well as a full rundown on the patches included. Loving this library so much. It’s amazing.